Okay, so I'm going to confess right now, this is going to be a really bad week for posting.... the holiday season is almost here, Christmas concerts are on, parties are planned, gift wrapping is being done, you get the point! I'm sure you are doing the exact same thing and scrambling to finish up the last minute details. 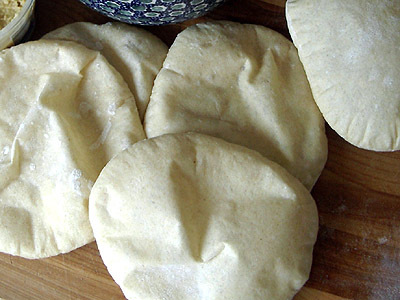 So, while you have a minute, I'm going to share this pita bread recipe that I desperately want to try over the holidays. There's nothing better than sitting down at a restaurant and ordering some fresh pita and dip for an appetizer. So, while I keep scrambling with last minute musts - be sure to pin this recipe and take a time out to enjoy it very soon!! If needed, activate yeast. Otherwise, mix the yeast in with the flour, salt and sugar. Add the olive oil and water and stir together. All of the ingredients should form a ball. If some of the flour will not stick to the ball, add more water. Once all ingredients form a ball, place it on a work surface and knead or mix it at low for 10 minutes. When you are done, place the doug in a bowl that is lightly coated with oil and roll it around to coat all sides. Cover the bowl with plastic wrap or a damp kitchen towel and set aside to rise until it has doubles - approximately 90 minutes. When it has doubled in size, punch the dough to release trapped gases and divide into 8 pieces. Roll each piece into a ball, cover with a damp kitchen towel and let them rest for 20 minutes. While the dough is resting, preheat the over to 400 degrees. If you have a baking stone, preheat it as well. If not, place a baking sheet upside down on the middle rack. When the dough is ready, spread a light coating of flour on your work surface and place one of the balls. Sprinkle a little bit of flour on top of the dough and stretch/flatten the dough. You should be able to roll it out to 1/8 and 1/4 inch thick. If the dough still doesn't stretch sufficiently, cover it with a damp towel for another 5 to 10 minutes. Open the over and place as many pitas as you can fit on the hot baking surface. They should be baked through and puffy after 3 minutes. If you want your pitas to be crispy and brown you can bake them for an additional 3 to 5 minutes. Get the original recipe here. That's it! Enjoy your pitas and be sure to take a moment to relax over the holiday season!